Yes, it’s that time again. Time to learn an amazing magic trick courtesy of the Super Friends! This time it’s Batman who’s going to show us how to impress our friends and get that promotion we’ve been hoping for by dazzling our boss with an illusion. Batman is in the Magic Theater and calls to Robin saying he needs his help. Robin then SWINGS IN ON A TRAPEZE, looking mighty proud of himself. Batman give Robin the once over and says, “You look like a strong young man.” What. A. Creep. 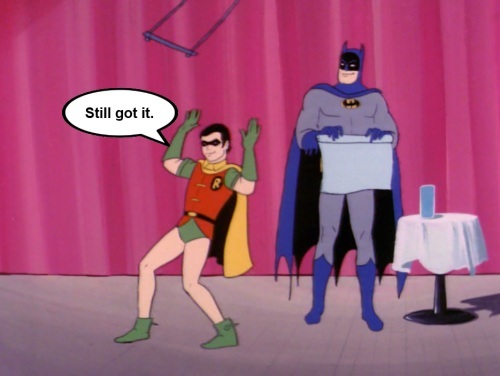 After some talk about Turkish prisons and gladiator movies, Batman says that this trick will be a test of his strength. 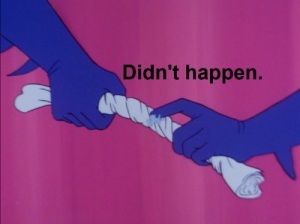 He twists a HUGE napkin – look at that thing in the above picture – into what looks like a track and field baton and hands it to Robin, telling him to take hold of either end of the napkin and try to pull it apart. “Child’s play, Batman!” exclaims the ever-confident Robin. Robin struggling with a napkin is now one of my most favorite Super Friends moments. Robin starts from scratch – twists up a napkin and still can’t tear it in half. “That’s because you didn’t use some water!” Batman bullshits. 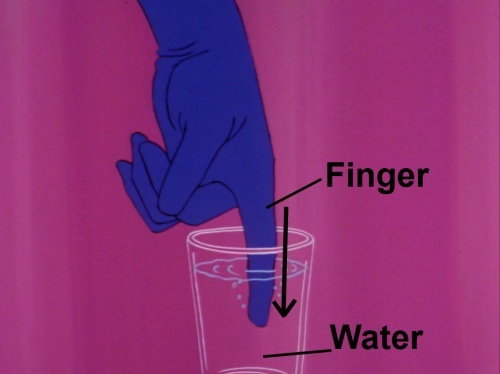 As with previous magic tricks, the animators weren’t exactly clear about what was supposed to happen based on the script. So, in the initial demonstration, at no point could Batman have actually used any water – there’s no cuts or anything that would have conceivably been a time when he could have applied water to the napkin. But, I’m getting ahead of myself. Batman’s suit emblem kept switching colors. Now THAT’S magic. And yes, I will be attempting this magic trick later in the week. I didn’t realize Robin was Ralph Malph in a mask. And did he say the f word while trying to rip that napkin? It looks like it, doesn’t it? He didn’t say it but he does look like he ages 40 years. The explanation was probably just to make Robin feel better. 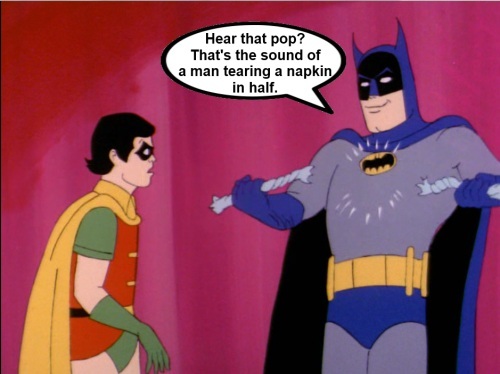 I suspect he actually used Bat-Napkin Dissolving Fluid, which he naturally excretes through his gloves. Also, Airplane references make me happy! Yes! Bat-napkin dissolving fluid must have been it, there’s no way it doesn’t exist, he has bat-everything else. You had me at trapeze. In that moment he was so happy, then he gets humiliated – so sad. I’m calling shenanigans on this “magic” trick again. Um, tearing a napkin in half? Yeah, I think David Blaine is going to use that in his next tv special. In the next super friends magic trick I expect they will teach us how to turn one piece of paper into two smaller pieces of paper. Have a good weekend, Carrie. They already taught us how to turn a thin wooden board into two thin wooden boards. Paper’s gotta be next. I’m starting to think that maybe doing simple magic tricks isn’t the best use of a super hero’s time. Maybe Aquaman’s but definitely not Batman and Robin’s. And why do they have a Magic Theater? WHY? It’s not exactly sawing a woman in half, now is it. Also, really? As former carnie folk, Robin didn’t suspect the game was rigged from the beginning?!?! Yeah, he should have been suspicious. It’s worth it to me because it gave me a good laugh. Now, go get a haircut! Ripping a napkin in half. Wow. That trick should impress absolutely no one. The only person I think it would impress would be Aquaman. I was hoping for another Magic Time with Carrie video! Previous Previous post: The 1972 Sears Wishbook – Fun Bags should not be marketed to kids.